A little more than twelve hours after the Cleveland Cavaliers bounced the Chicago Bulls from the Eastern Conference Semifinals, rumors are already circulating that Bulls’ coach Tom Thibodeau will be relieved of his coaching duties despite having two more years remaining on his contract. This would be a terrible mistake by the Bulls’ organization and Thibodeau will more than likely be snapped up by the New Orleans Pelicans or Orlando Magic. Thibodeau and Bulls’ management reportedly have been at odds all season and a parting of ways is likely. However, Thibodeau has the support of many players including point guard Derrick Rose, center Joakim Noah, and power forward Taj Gibson. Rose is hoping his coach returns. Noah seems uncertain about whether his coach will return. When a coach has support from two of his biggest stars, it is tough to let him go. However, that is what the Oklahoma City Thunder did when they fired Scott Brooks who had the support of stars Kevin Durant, Russell Westbrook, and Serge Ibaka. Thibodeau says he plans on coaching the Bulls until someone else says otherwise. That does not sound like someone who wants out of this relationship as much as Bulls’ management seems to want to move on from him as their coach. Reports are stating the Bulls will look for draft picks in exchange for the rights to negotiate with Thibodeau. While there is supposedly a mutual interest between the Pelicans and Thibideau, the Orlando Magic reportedly are willing to trade a second rounder or two for Coach Thibs. Since he is under contract, Thibodeau could pick his next coaching destination even if the compensation is not the highest because he has to be willing to negotiate with that franchise. Say the Magic offer two second rounders and the Pelicans offer only one, Thibodeau could say he is only willing to negotiate with the Pelicans at which point the Bulls would have to decide whether to trade him to the Pelicans, keep him, or fire him and receive no compensation and have to pay the remaining two years of his contract. I believe Thibs is in the perfect spot to call the shots. If he plays hardball about being traded, he could be retained and have the opportunity to continue coaching a very talented Bulls’ roster. He can also evaluate the roster of any team willing to trade with the Bulls for the right to negotiate with him. In viewing the Magic roster, they have a strong big man in center Nikola Vucevic, and a young backcourt in shooting guard Victor Oladipo and point guard Elfrid Payton. However only six players on the roster averaged more than 19 minutes a game meaning depth is a concern. The Pelicans are an enticing option. They are a team on the rise and knocked the Thunder out of the eighth playoff spot in the Western Conference. Power forward Anthony Davis really came into his own this season averaging 24.4 points, 10.2 rebounds, and 2.9 blocks during the regular season. Center Omer Asik is adequate but must become better offensively to give the Pelicans two bigs who could dominate like Tim Duncan and David Robinson once did together in San Antonio. Former NBA rookie of the year Tyreke Evans can play both small forward and shooting guard. The back court of point guard Jrue Holiday and shooting guard Eric Gordon have both been in the league five or more years and have shown signs they can elevate their game to higher levels. Power forward Ryan Anderson gives the Pelicans the option of playing Davis at center. There is much more depth on the Pelicans than Magic although the team has to regret shipping shooting guard Austin Rivers to the Clippers after he has been clutch throughout most of this year’s playoffs. If I were Tom Thibodeau, I would sit down with general manager Gar Forman, team president John Paxson, and team owner Jerry Reinsdorf as soon as possible to discuss his future. The Bulls were strong contenders this season when healthy. Injuries were a big reason the regular season record was not better and what hurt the Bulls in this series. 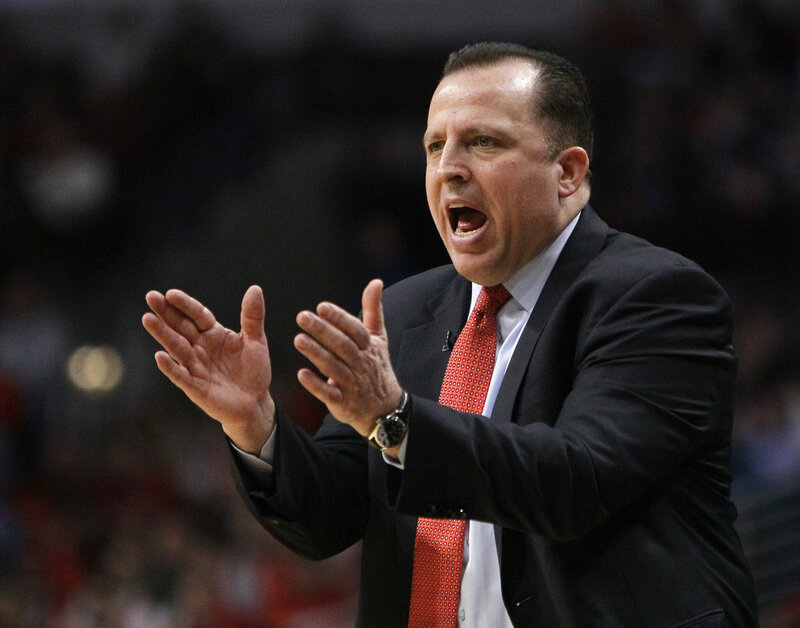 The Bulls need Thibodeau as much as he needs them. Moving on to another coach like Iowa State’s Fred Hoiberg or promoting a Bulls’ assistant is not what is best for Coach Thibs and the Bulls.